Nowe Motywacje, Centrum Ikea dla Firm, Vastint and SPCC has a pleasure to invite our member companies to a workshop about "HR challenges of 2019, and not only". We will take a closer look at HR actions and strategies that need to meet the requirements of dynamic market. The COP24 event highlighted the importance and urgency of discussions regarding energy and climate. Those topics are crucial for further development of Polish as well as Scandinavian markets. 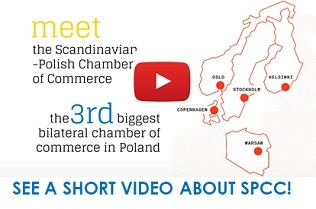 SPCC as every year is a Partner of Scandinavian Days in Szczecin. For the 6th time Scandinavian business community from the region will meet and discuss cooperation possibilities. We especially invite you to Nordic Trends in business panel disscusion organized by SPCC along with Sigma Connectivity, Kinnarps, Coloplast and others. Embassy of Sweden invites you to a meeting about the unusual and somewhat forgotten history of the “ladies from the Swedish tower”, or telephonists, who were employed in Warsaw by Ericsson at the beginning of the 20th century. Thank you everybody for participating in our recently meeting in Gdańsk, Digital Seminar with Avaus Poland, Finestmedia and Hempel. It was a great pleasure to learn about new digital solutions and how they can improve our everyday business operations. The Annual General Assembly of the Scandinavian-Polish Chamber of Commerce was held on the 20th of March 2019 in Warsaw. At the meeting Carsten Nilsen- SPCC's Chairman summed up activities performed by the Chamber in 2018 and the board presented the bugdet and plan of SPCC's activites for 2019, which were approved by the General Assembly. Fortum has invested in the Finnish start-up Infinited Fiber Company Ltd. (IFC). The company develops and will license technology that is used to manufacture cotton-like fibre for the textile industry from recycled fibre and cellulose. In February, HUB logistics has launched operations in new warehouse facility located at Sokołowska 50 in Pęcice near Warsaw. Scania has announced it will deliver 100 LNG fuelled trucks to KP Logistik, based in Stavenhagen, Germany. The Scania R 410 prime movers will be evenly split between KP Logistik’s centres near Berlin. VELUX Group has renewed the lease agreement for its office in The Park Warsaw complex. Experts from JLL once again represented VELUX Polska in the process of negotiating lease terms. Maruta Wachta, a member of the SPCC, has been elected the best law firm in Central Europe by UK magazine The Lawyer. The award was received on behalf of the law firm by its partner, Daniel Jastrun. We would like to invite you to our seminar: Changes To Transfer Pricing From 01/01/2019. The event is meant to systemise the knowledge of transfer pricing matters. Advisory firm JLL summarizes H1 2018 on the retail market in Poland. The latest edition of of Danske Bank's economic news, including trade friction between the US and China, international monetary policy and analysis of global and local economic indicators. We have the pleasure to present you with the latest SPCC Report "Nordic Insights - trends shaping the future of business". Together with infuture hatalska foresight institute we identified 14 trends related to the most popular innovations currently being developed on the Scandinavian market and worth a close look within the further development of Scandinavian-Polish cooperation. On 17th of May 2018, Members of SPCC met with Minister Jadwiga Emilewicz and discussed how Scandinavian companies operating in Poland can contribute to the development of innovations in Poland and Industry 4.0. According to foreign investors, Poland’s competitive advantage lies in the EU membership, quality of staff, availability of local subcontractors and increasingly better infrastructure. Unfortunately, foreign companies operating in Poland see a decrease in the availability of qualified employees. You will get all the answers you need during the Conference we organize as a part of our annual training programme “Wednesdays with GDPR”. SPCC members have a 15% discount. Puls Biznesu - free digital subscription for SPCC members! Full Premium Digital access for 1 month. Take the Family Sundays offer and relax in the pool & sauna area for free! LOOP Fitness would like to offer SPCC members an exclusive fitness membership package, applicable to any company employee of an SPCC member. We put you at the center of Gdansk. Hotel Puro is situated in the Gdansk Old Town Center, just 150 meters from Green Gate and 300 from Long Market Street. An offer for SPCC members prepared by Enterprise Logistics.